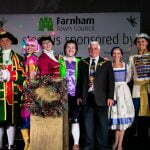 The Mayor of Farnham Cllr David Attfield switched on Farnham’s Christmas lights on Saturday with help from a surprise guest. Arriving on a horse-drawn carriage, Father Christmas was greeted with cheers and applause as he made his way onto the stage. 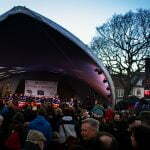 With a drum roll from the Taiko Drummers and an enthusiastic countdown from ten by the audience, the Mayor of Farnham and Father Christmas switched on the lights and declared the start of Christmas in Farnham. 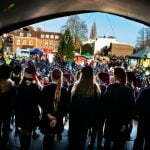 Throughout the afternoon, a crowd of thousands enjoyed no fewer than 15 performances by young people from local schools, theatre, dance and music groups as well as Quicksilver, which is a dance company for older people. 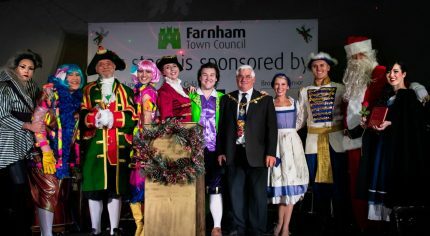 Cast members from the Prince’s Hall pantomime Beauty and the Beast made a guest appearance and the Town Crier Jonathan Jones gave a powerful rendition of ‘Twas the Night Before Christmas. 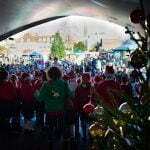 The entertainment was compered by John Collins and background music was provided between performances by Betsa. 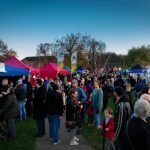 The next event in the Christmas in Farnham calendar is the Christmas Market on Sunday 9 December from 10am to 4pm. 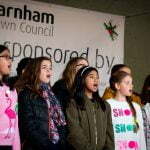 Also look out for the ballot for tickets for the Civic Christmas Carol Service with the Farnham Youth Choir in this edition of the Herald and again on 29 November. 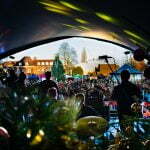 For a full list of what’s happening, visit www.farnham.gov.uk/christmas.